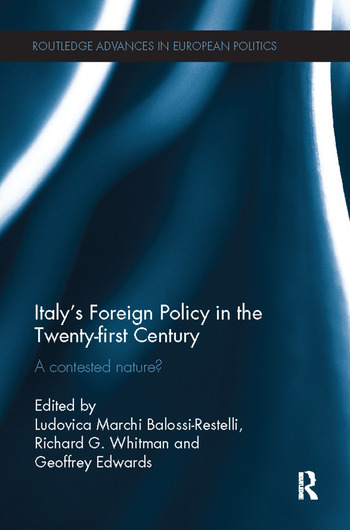 Italy's Foreign Policy in the Twenty-first Century: A Contested Nature? Italy’s foreign policy has often been dismissed as too idiosyncratic, inconsistent and lacking ambition. its security and defence policies. This book will be of interest to students and scholars of European Politics, Foreign Policy analysis and Italian studies. Ludovica Marchi Balossi-Restelli (pen-name: Ludovica Marchi) is an International Relations political scientist, former Teaching Assistant at the University of Cambridge, UK and External Examiner on the International Relations and Global Politics programme at the American University in Rome. Richard G. Whitman is Director of the Global Europe Centre and Professor of Politics and International Relations at the University of Kent, UK and Associate Fellow at Chatham House (the Royal Institute of International Affairs). Geoffrey Edwards is Senior Fellow and Emeritus Reader in European Studies in the Department of Politics and International Studies at the University of Cambridge, UK.